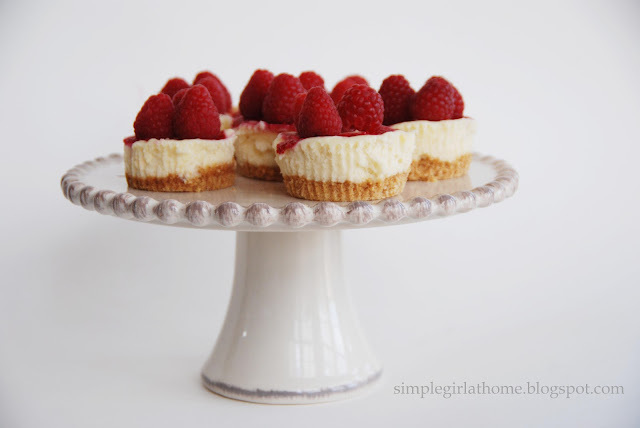 This month's Martha Stewart Cupcakes Club selection was Raspberry Marble Cheesecakes. 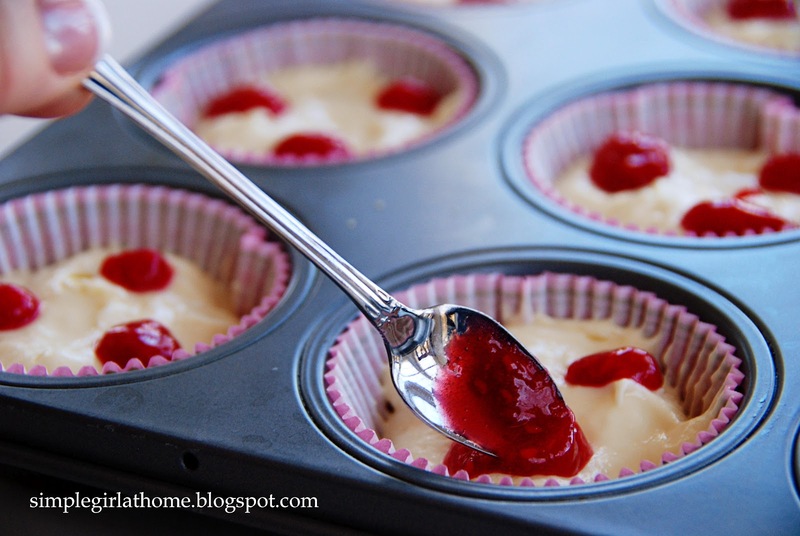 These beautiful little classic cheesecake "cupcakes" turned out to be the perfect Valentine's dessert, but they were so delicious, you should make them any time any time of year. The cheesecakes had three basic components: The graham cracker crust, the cheesecake filling and the raspberry swirl topping. 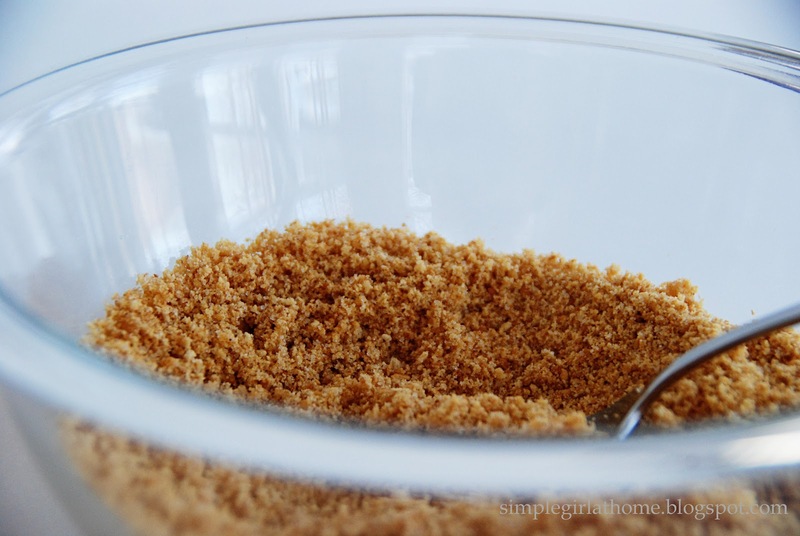 The delicious graham cracker crust is made from melted butter, sugar and crushed graham crackers. 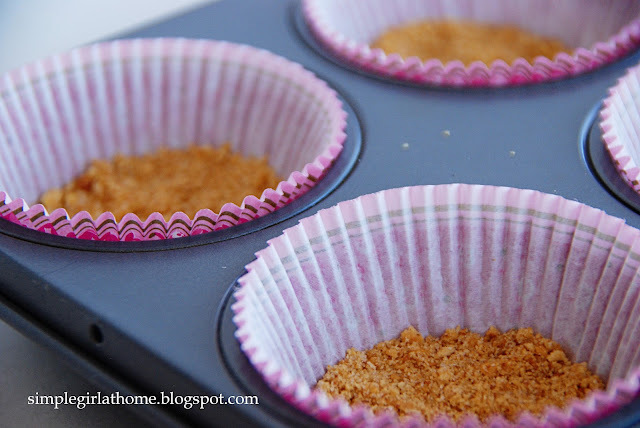 Mix the crust together, put about 1 tablespoon crust mixture in the bottom of a lined muffin tin and bake until set. Now FYI, these little cheesecakes will turn out just fine if you forget to pre-bake the crust. Don't ask me how I know this. Just go with me on this one. 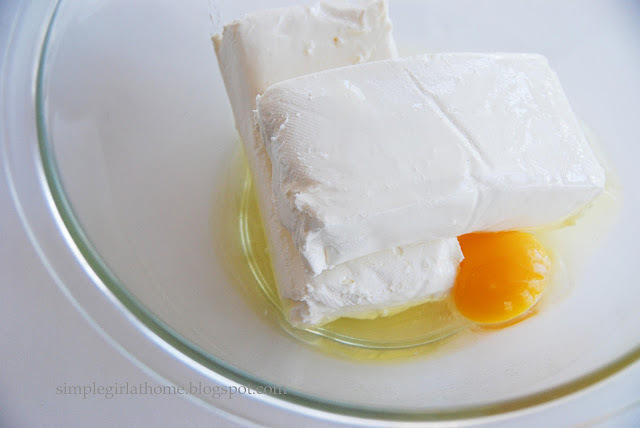 Next mix together the cream cheese, eggs, sugar, vanilla and salt. You probably didn't need to see a picture of this, but I thought that yellow egg was so pretty! 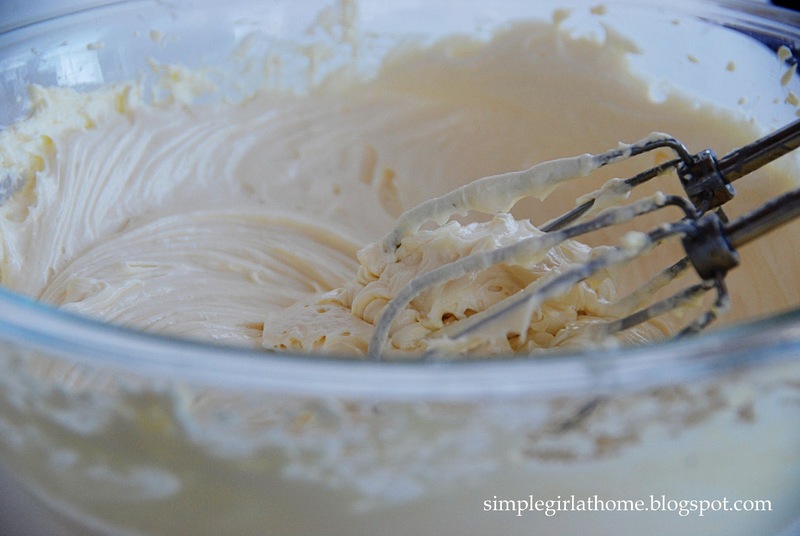 Scoop three tablespoons of cream cheese filling over the crust. Here's how you make this part if you don't have a food processor or a fine sieve. 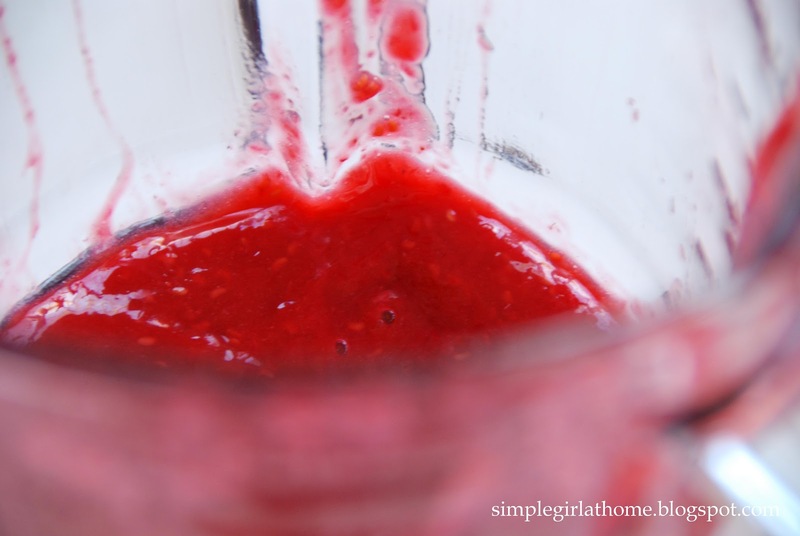 Get out your trusty blender and add the raspberries plus the sugar. Blend until it turns all beautiful and syrupy. Leave the seeds. There is nothing wrong with raspberry seeds. It's not that I'm lazy, it's just that we are making cheesecakes, not performing brain surgery. Seeds are good. And pretty. And raspberry-y. Next, take a moment and admire the beautiful thumbnail in the corner. My "twin" cousin, the marathoner and world traveler, is flying a million miles from Canada to see me for 20 hours this weekend. Since I won't be able to train for a marathon, or a 10K, or even a 5K in the next four days, my only hope at preserved self-esteem was to get an OPI-gel manicure. I hope you understand. I love her and I can't wait to see her! 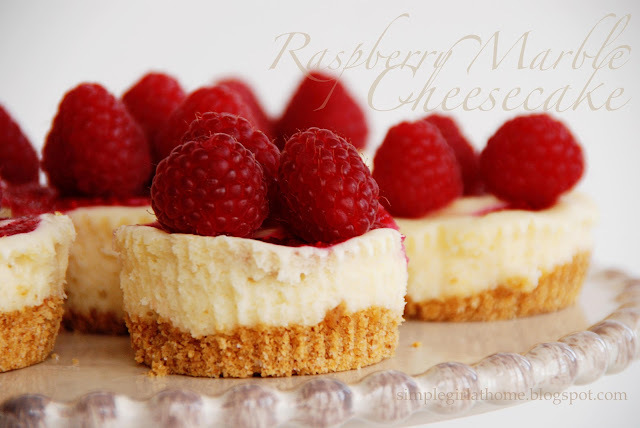 Take that beautiful raspberry puree and make three baby spoonful on top of each cheesecake. 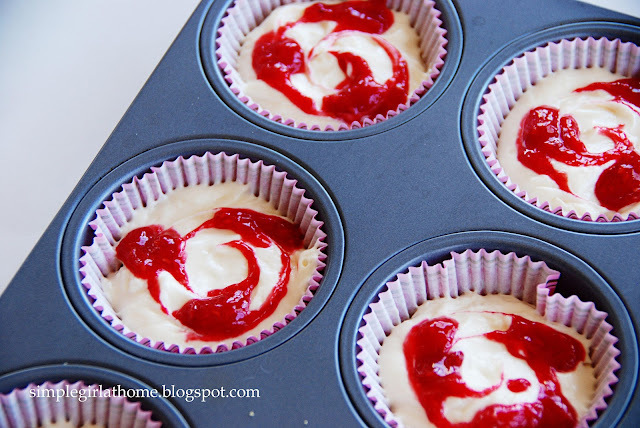 Make a spiral through the puree with a toothpick for these beautiful swirls. 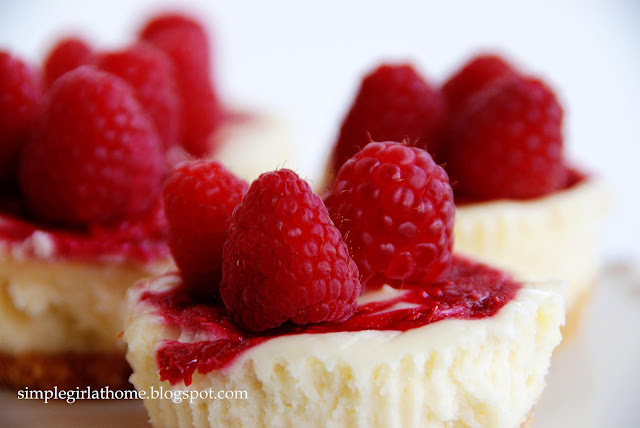 Top the finished cheesecakes with fresh raspberries. Be prepared to hear comments like, "Mom, these are the best things EVER!" 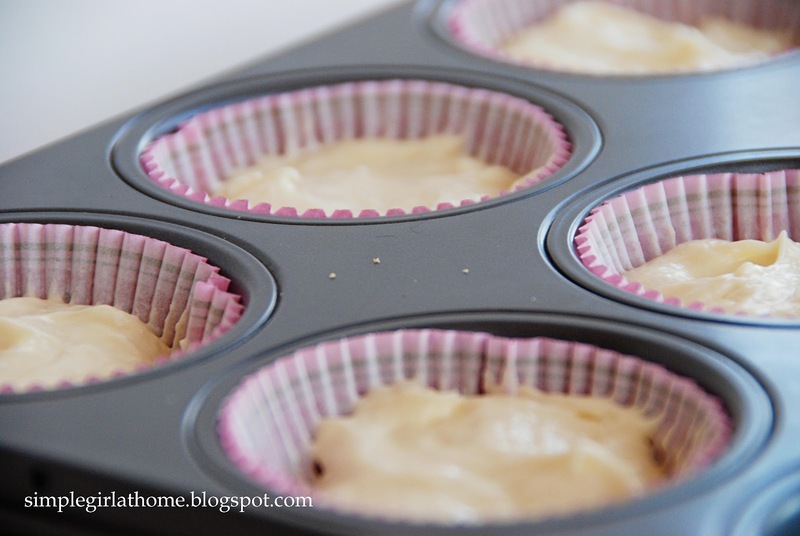 You can find the recipe on Martha's Website, just portion it out into cupcakes! Thanks to Gem at Cupcake Crazy Gem for this month's selection! Check out the other bakers HERE and join us next month for Lavender Iced Brownies! and it's a pretty mani. Yours are beautiful! I love the idea of taking the raspberry one step further by topping them with the berries. Mine are sitting in the fridge, waiting to be eaten. Cheesecake for breakfast? They are really great photos, Rebecca- mine are in the fridge and I'm thinking the exact same thing! I love that you topped yours with fresh raspberries too, your raspberries looked really fresh - like you went to the farm to pick them or something! 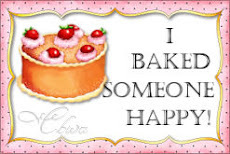 Glad all who you baked for enjoyed them so much! Thanks for letting me pick this month, it was fun! These sound divine! I'll have to give them a try. Raspberries are my absolute favorite berry. Visiting from T&J. Oh, yummm! I could eat one of those right NOW! You're making me hungry! Thanks for sharing at Shine on Fridays!! Oh My! Those look REALLY good! oh wow.. !!! Love, love these! Thanks for sharing. A beautiful presentation for a very delicious Cheesecake! 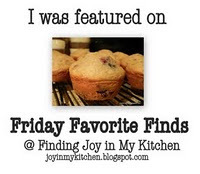 Thank you so much for sharing with Full Plate Thursday and have a fabulous week. I'm SO glad you linked these up! YUMMY! I will definitely make these soon! Yum! These looks amazing. Visiting from Skip to My Lou. These look amazing! My husband loves cheesecake...I think I'll surprise him one day with these :) Thank you so much for sharing at Mix it up Monday! I think I am in LOVE! Those look so amazing! 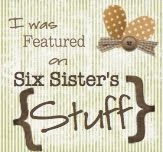 Thanks for sharing it with Six Sister's Stuff Link Party. We hope to see you back next Saturday! I'm Rachel....Wife. Mom of four. Martha enthusiast. Jazz lover. Woman of Faith. Northern Belle. I believe that life should be lived deliberately, but not taken too seriously. 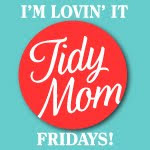 Join me as I blog about the simple things that make life great. Homemade Chocolate Chip Cookie Cake! iheartfaces | The Letter "A"
Airplane Valentine - Free Printable!